Preliminary results for the third ride in our ACP Super Randonneur series, the New Blue Redeux 400K brevet, have been posted on the PA Rando website. Despite the challenging ride, 28 of the 31 starters finished under the time limit for a 90% completion rate. Congratulations and well done to all. Please review the results and let me know if something doesn't agree with your recollections. The results will be submitted to RUSA for certification later on and become final at that time. On paper, the 400k should have been a smooth day: A rolling course vs. the extended climbs of the 200 and 300, just a bit of rain but otherwise favorable weather, quiet roads for the outbound leg, and a shifting tailwind assist for the entire second half to finish it out. But it ended up being a particular tough day for me, mainly due to the long stretches early in the day without real food available. I ended up in a hole I never fully dug myself out of for the rest of the ride. 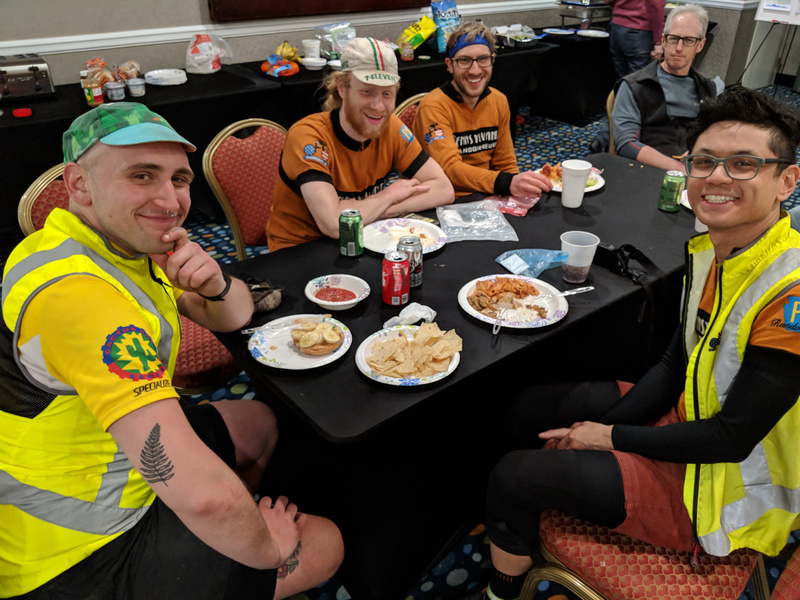 I sat and watched as our crew (Nick, Ryan, Jimmy, Paul W., and guest star Steve S.) happily devoured sandwiches, hoagies, pizza, and ice cream, while I was struggling to eat half of what I bought at each stop. Ouch. That being said, the course tweaks and the nice weather made the daytime riding pretty nice. I enjoyed the fog over the Blue Mountain ridge in the morning, we saw a family on an S&S tandem climbing with a baby trailer, and we happily whiled away the miles on the rail trails free from cars. Riding along the super-nice Warwick-Ephrata trail made me wish I was just on a short afternoon ride! The Foodery in Phoenixville was an excellent choice (thanks, Steve!) and we had a much-needed recharge of our mental batteries, which at this point was much more important than the physical refueling. Paul's rear hub was making some bad, bad noises through the ride, which Nick tried to calm down with some freehub oil, but unfortunately Level Rd. was where his hub/drivetrain met its fate. Lamenting the loss of our fallen comrade, we rode slowly through the night to Quakertown, where we met the nicest convenience store clerk in history... I think we proved ourselves much more personable than the usual clientele at 2 AM. We picked up Vadim here and cruised to a FINISH. To the riders who find my cycling form impeccable but my finishing times "disappointing", I would like to offer my most sarcastic and insincere apologies. Pictures here. See you for the 600k! Hi Andrew and Chris. Thanks to you guys and all the volunteers for your work on the 400 this past weekend. It was a great course and the stretch from Bowman’s Town to Blondies was not nearly as bad as we remembered. Fresh legs and cooler temperatures can really flatten out some hills. Thanks again, see you at the 600. Thank you for a great event! It was, no doubt, one of the most difficult rides for me. The scenery was beautiful and the route was planned very safely. Having a ride this difficult this early in the year can truly test one”s limits. Looking forward to the 600k, now that the bar has been set! Most envious moment: seeing happy people sitting for a leisurely dinner in Phoenixville. Coming up next are the Eastern PA Fleche ending at the T-Town Velodrome. After that, it's the final event in our ACP Super Randonneur Series, the epic Philly - Pagoda - Pocono 600K. See you there!